This article first appeared in The Edge Financial Daily, on November 20, 2017. If corporations do not adopt digital innovation strategies, they risk being left out of the main engine of growth for the future economy and, eventually, rendered irrele­vant. 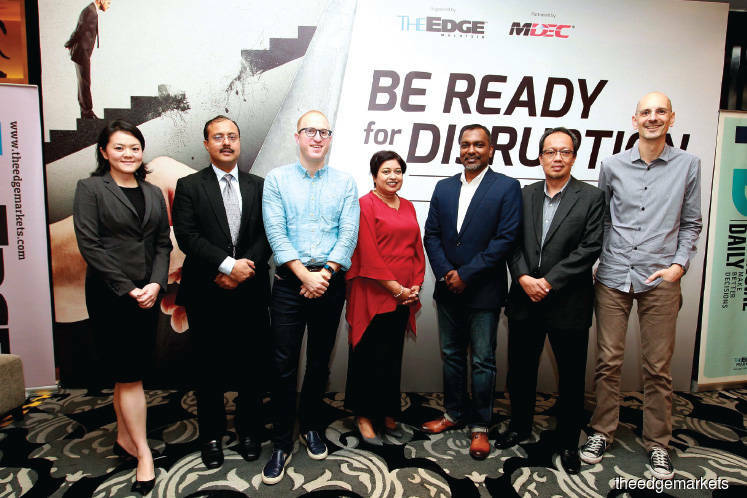 They must wake up to this reality and adapt, Malaysia Digital Economy Corporation chief operating officer Datuk Ng Wan Peng says at the The Edge-MDEC forum for CEOs on “Be Ready for Disruption”. “About 50% of S&P 500 companies may disappear in the US because they will be threatened by digital companies. By 2027, an estimated 50% of the market of non-digital companies will be taken over by thousands of start-ups and digital companies. We see it happening in the retail market, for instance. Thousands of retail outlets have been shut down — especially in the US — such as Macy’s and Toys ‘R’ Us,” Ng says. The demise of many of these companies comes as digital solutions, such as e-commerce, have gained popularity among customers. If corporations like Wal-Mart — or in the case of Malaysia, Tesco — move online, Ng says, they can balance out the impact of the new players in the business. By going digital, corporations can tap a growing economic sector in the country. “Digital adoption is the key to future growth and our engine of growth. On the macro­economic level, digital transformation has the potential to have a significant impact on Malaysia’s economy. Based on our work with McKinsey & Co, the estimated increase of the economic impact is RM400 billion in 2025, if all of us embrace technology and do something about it,” Ng says. Adapting may be crucial for corporations that want to hold on to young talent as well as customers who demand instant res­ponses. “If I buy something, have a complaint or question and send an enquiry, do I get a response on the same day? If a business is not ready, they are going to lose out,” Ng says. Last year, the digital economy contributed 18.2% to gross domestic product, which was the target for 2020. The revised target for 2020 is 20%. The sectors that are seeing the most digital disruption are financial services and insurance. In Malaysia, MDEC is working with Bank Negara Malaysia and the Securities Commission Malaysia to look at how banks can embrace technology to survive the potential impact of new players introducing functions such as mobile wallets and peer-to-peer lending. As for the insurance sector, online platforms are beginning to sell and compare insurance products. “In China, platform players like Alibaba and Tencent were given licences to run their offerings in July and September respectively. If it can happen elsewhere, it can happen here,” Ng says. The government is also taking initiatives to spur the digital economy by promoting the Digital Free Trade Zone (DFTZ), she says. The DFTZ, which went live this month, uses technology to facilitate cross-border e-commerce and logistics. “We are very happy to know that Petroliam Nasional Bhd recently declared its digital strategy with the appointment of a chief digital officer, and it is allocating RM600 million to RM800 million for its digital transformation journey,” Ng says. For corporations that wish to adopt digi­tal strategies, it might be wise to carefully consider their options and resources before putting down any investment. As The Edge editor-in-chief Azam Aris points out in his speech, corporations should take time to understand the options. “In this increasingly bewildering world, it is easy to get swept off your feet and invest for the sake of investing in a desperate attempt to keep up with the competition. What you need is a compass that will direct you north so that you understand your businesses better and all the innovations that have been taking place in your industry. And today, it is not enough to know what the present state of play is. You need to know what innovations are out there and those in the pipeline to help you perform better,” he says. An option offered by MDEC is the Value Innovation Platform (VIP), which was introduced last year. It is a government initiative to help corporations develop a structured plan to adopt digital strategies, in collaboration with Rainmaking Innovation. So far, Digi-X, Gamuda Bhd, Malaysia Airlines Bhd, KPJ Healthcare Bhd and IJM Bhd have come onboard. MDEC is also working with the Entrepreneurs’ Organisation, an alliance of over 100 mid-tier companies, through a digital discovery initiative. It is also collaborating with the Federation of Malaysian Manufacturers and the Human Resources Development Fund on digital innovation.